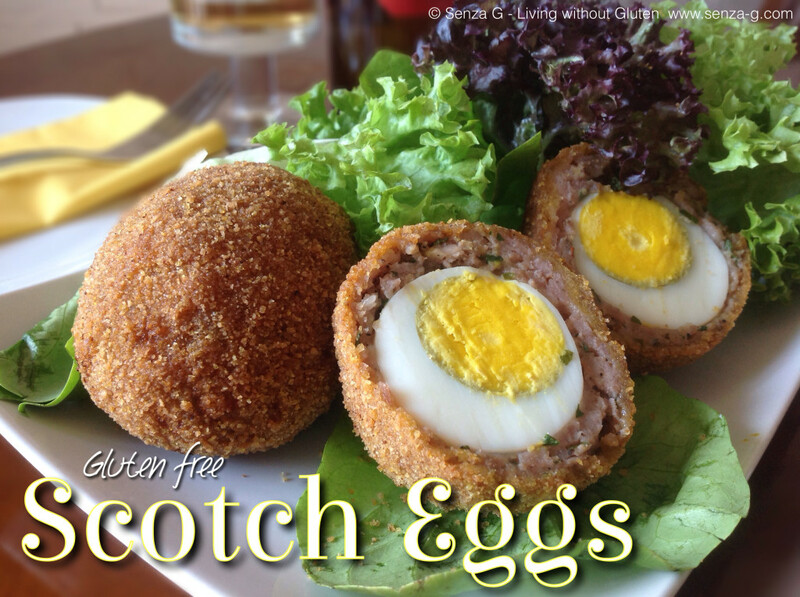 Home » Food » Scotch Eggs – The Perfect Picnic Fare! Scotch Eggs – The Perfect Picnic Fare! These are just plain scrumptious! A hard-boiled egg encased in herby Italian sausage meat and then covered with a crispy and crunchy shell! They are even great cold and still as crunchy! This is my gluten free version. Start by boiling 4 of the eggs in a medium saucepan. When hardboiled, remove, leave to cool and peel the eggs. Remove the skins from the sausages and put the mince in a bowl. Chop the fresh herbs, calculating that you will have approximately 1 heaped tsp of each herb. Season with salt, pepper and garlic pepper and add the chilli if using. Add also the mustard and combine well. The amount of herbs is up to you, so feel free to add or even omit any of the above. Split this mixture into four. Set aside. Prepare three bowls and put the gf flour in one, the beaten eggs in another and put in the polenta mixed with the breadcrumbs in the last one. I use polenta as it helps to make the crust even crispier. Dust your hands with the gf flour. Take one egg at a time, coat the egg with the flour, then take the sausage mince and mold it around the egg. The egg has to be completely coated with the sausage mince. Place on a lined baking tray. Do the same with the other three eggs. Take again each egg and place it in the beaten eggs followed by the breadcrumb/polenta mix. Ensure that it is totally coated. Continue with the other three eggs. Repeat this process again and refrigerate the eggs for at least half an hour. If you have a deep fryer, the result will be better however if you don’t, then half fill a high saucepan with oil and fry the eggs two at a time for approximately 5 to 6 minutes. Turn them occasionally until they are golden brown all over. They are lovely warm and equally delicious cold, served with a green salad.